Burning Man, the once-a-year gathering in the Black Rock Desert in Nevada, will continue to challenge and inspire its participants courtesy of the Temple of Direction that will be present at the August 25 through September 2 2019 event. The structure will be starkly minimalist and stay in tune with the spirit of the festival in that it won’t distract from the larger natural landscape around it. Van Der Bosch’s design will empower both personal reflection as well as collective interaction in a wide open area at its center in which Burning Man participants can take solace in quiet or engage with each other around its altar. Lanterns will illuminate both the outside and interior. There will be four ways to enter and exit. Visitors to the Temple will be free to explore it with the same spirit of discovery that animates the larger burningman gathering. Geordie Van Der Bosch’s design was chosen from a pool of submissions. 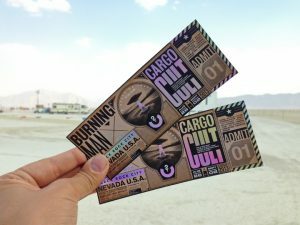 The burningman Network selected it because of its “elegance and simplicity.” While Van Der Bosch describes himself as a West Coaster because he’s lived in every state along the Pacific, he’s also done his share of world travel and has spent parts of his life in both England and Japan. The Fushimi Inari Shrine in Kyoto was a major influence on the Temple of Direction’s magic simplicity. The Construction process will enable members of the community to collaborate on rendering the design real. The building process will be an opportunity for those who travel to the desert to be part of its construction or do something imaginative within the framework of the deep group experience that enriches the Black Rock City event annually. The non-profit organization is expecting to put out a call for volunteers to help bring the blueprint to life in the Spring. The non-profit organization based in San Francisco continues to honor its founding principles by encouraging those who are motivated to contribute to the coming together of the event by being active in sharing ideas and opinions about it. Those who make the trek into the desert in 2019 to be part of the once a year ritual, can anticipate that it will be a larger population than last year since the gathering has consistently attracted greater attention. 51,515 people were part of it in 2010. 70,000 are said to have made the trek into the desert last September to be part of an experience some call a “festival” but others say is a unique temporary city. Of course, many of its regular participants would insist that Burning Man is something that entirely resists description.